The moment when Microsoft announced the release of its decision based search engine (Bing.com), a team of Google Developer in Sydney Office announcing the launch of “Google Wave”, an unofficial reply to Microsoft’s new Decision Search engine. So, what is Google Wave? In Google Wave, when you create a wave and add people to it, everyone on your wave can use richly formatted text, photos, gadgets, and even feeds from other sources on the web. Your fellow friends can then insert a reply or edit the wave directly. 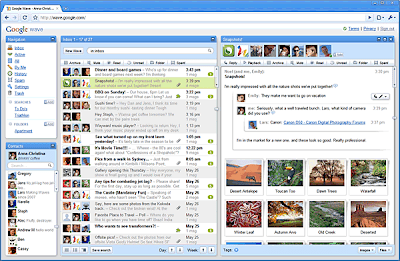 This will included document & photo sharing, instant messaging, e-mail checking, wikis, blogs, and most likely connecting all the Google services in one point to allow real-time and stored collaborative messaging. You may also want to check out the developer preview at Google I/O. Watch it if you have time, it’s about 1 hr 20 minutes conferencing video. Read more about Google Wave from the Google official blog. To know when will the wave to be released for public, sign up on Google’s official website to stay tune for any updates announced.